[Review] Is RevenueBrust.com Fake Or Real ? Today, I going to review yet another fake website that is circulating on social media like Facebook. Ever want to earn money through online jobs without the hassle and exerting effort? There is NONE! You need to work hard to make money especially online. With that, if you something like RevenueBrust.com captured your attention, be aware that it is not worthy of your precious time. If you happen to visit it, it has a lot of information that state that you can earn huge amount of money with just sharing referral link. RevenueBrust.com is leading Cost Per Referral (CPR) advertisement company based in USA which offers "get paid for referral link" service. We have leading companies with-in our Network for referral advertisements. Share referral link with your friends and family and earn money. Home based job for all people. In short, the only job you are about to do is just referring your LINK. 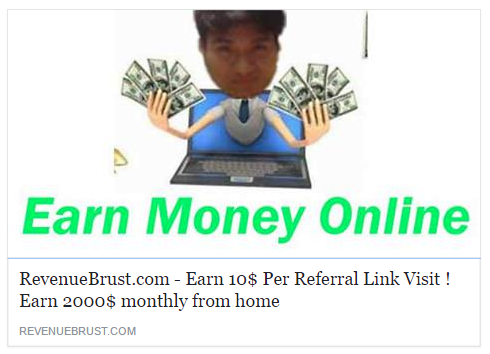 Get Paid For Referral Link VisitShare your referral link with friends, Earn money 10$ for every link visit, Instant Min withdrawal of 400$. Highest rates in advertising market and we are paying 10$ for every visit your friends make through your ref link. EU2 Certified program. 1. The name itself is doubting! RevenueBrust or correctly its "RevenueBurst" ? If you are running a business involving money, then you should have thought an appealing name. Wrong Spelling is wrong! Okay, be skeptical about it, how would a website that gives an enormous amount of money, when in fact, the registration page has no security feature whatsoever. I mean its plain and straightforward. Your details can be exposed, and they can sell your email address and name to other third-party websites. So be extra careful, and I advise, do not engage and join with RevenueBrust.com. Well, there is nothing to prove because it does not exist in the first place. Remember, to see is to believe! In every legit website, they have this kind of feature, a forum, where members and admins are interacting and sharing ideas about the service of its website. Again, there is no such thing. You will expect it on fake internet sites. I already had reviewed several similar fake websites, and this RevenueBrust.com has the same design to this site, Referral Task. So think twice, don't join! I want to share some of my ideas; I hope you have gained basic knowledge on how to determine what is fake or real. Of course, I must admit, well, at first, you quickly fall into this kind of website. But lesson learned in an experience way. Thus, it is okay to fail and learn a lesson. Do research indeed! Better try ClixSense, although, I must admit it is hard to earn huge amount of money. Still, it is a legit one.